And yes, it’s true that as Washington became increasingly disenchanted with Chalabi, he turned to Iran as his patron. US policymakers pinned their hopes on other Shiite leaders, like Ayad Allawi, a London-based exile who founded the Iraqi National Accord in 1990, and eventually Nouri al-Maliki, the leader of the Islamic Dawa Party (حزب الدعوة الإسلامية‎). Allawi proved to have as little grassroots support as Chalabi, and he lasted less than a year as prime minister. Maliki proved to be a far more skilled politician than Allawi, but his initial success as a unifying nationalist in the 2009 elections gave way to an increasingly sectarian administration that excluded prominent Sunnis from the vice-presidency and key ministries and that became increasingly alienated from US officials. Disappointment with Iraq’s squabbling politicians was so bad that, after the 2013 elections, Chalabi incredulously became a candidate for prime minister in 2014 before Islamic Dawa and its allies eventually coalesced around Haider al-Abadi. To the end, Chalabi scrambled to win over allies from any community, religious or secular, Kurdish or Arab, Sunni or Shiite, in his plan to ride to Iraq’s rescue as the man with a plan to crush the jihadist ISIS/Daesh/Islamic State. 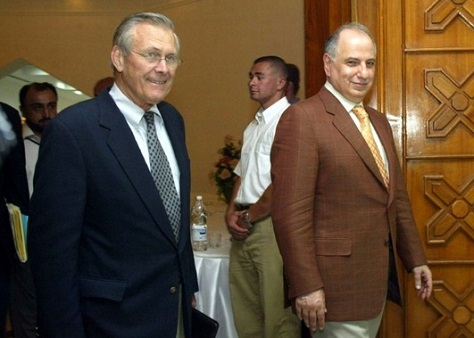 It’s easy to condemn Chalabi as a fraudulent grifter who connived with the Bush administration’s most gullible hawks to foist upon Iraq a destabilizing invasion and even more devastating occupation and civil war. But Iraq’s sorry state today is not merely a reflection of the invasion, occupation or even the Obama administration’s decision to end the US military presence there in 2011. Analysis based on hindsight is perilous, and there’s no way to assign neat percentages to the causes of Iraq’s instability today. But it seems now certain that the US invasion of Iraq took place in the middle of a widening shift across the region shaped by all sorts of forces — youth disenchantment and unemployment that spawned the 2011 ‘Arab Spring’ protests, ongoing sectarian tensions inflamed by a regional cold war between the Saudi monarchy and the Islamic Republic of Iran, and the unfastening of arbitrary borders set mostly by Europeans at the end of World War I. Moreover, within Iraq, a fleeting moment of optimism in 2008 and 2009 quickly gave way to mind-shattering corruption in Iraq’s national government and the increasing exclusion of Sunni and Kurdish Iraqis. Saddam was just 69 when he was executed. Had the US invasion not toppled him, he might well still be in power today. Maybe not. But there’s every indication that, had Saddam survived the Arab Spring protests, he would have worked to bequeath an authoritarian Iraq to one of his sons, just as the Baathist Assad family in Syria. Iraq today is a minefield of ‘what ifs.’ Without an autocratic government willing to use chemical warfare to repress its own citizens, the tripartite divisions in Iraq would have emerged no matter the context of Saddam’s ouster. So it’s not hard to believe that the transition away from Saddam’s Baathist state would have always been difficult, even without a Syrian civil war imploding on Iraq’s western border. Chalabi’s role was so important for a brief period that it’s hard to imagine post-Saddam Iraq without him. He may have been a disappointing and corrupt politician whose smallness prevented Iraqis from embracing him as the kind of Mandela figure that he must have imagined to be received, at least by Iraq’s Shiites. But he single-mindedly accelerated Iraq into a new (and dangerous and destabilizing) period, and we will not know for years, maybe even decades, if Chalabi’s gamble was wise or reckless. Today, few look back on the invasion as a high point of US foreign policy, and fewer yet in the United States believe that it was a wise use of American lives, money or international goodwill. But Chalabi died in an Iraq where Iraqis — not Saddam, not the Americans and not even Iran — have the means to control their own destiny.